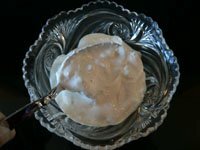 This recipe creation of horseradish sauce is to compliment a variety of beef dishes. I made it for Tom’s prime rib the other night and a few guests liked it so much they put some on their baked potato too. You can make this sauce however strong you like. I prefer to make it with the lesser amount of horseradish called for in the recipe, so as not to over power the blue cheese or meat flavor. Mix thoroughly sour cream and whipping cream before adding any other ingredients. Blend in Blue Cheese. Add remaining ingredients, mix completely and keep refrigerated until ready to serve. Tips: Make a day earlier than needed and store in refrigerator so flavors have chance to blend. Take out 1 hour before serving. This sauce can be use on any beef dish such as roast beef dinner, steak, Prime Rib, tenderloin, burgers.